Is CBCT All It’s Cracked Up to Be? I love my cone beam so much I want to kiss it. This machine has revolutionized the way that I practice and is a total game-changer. 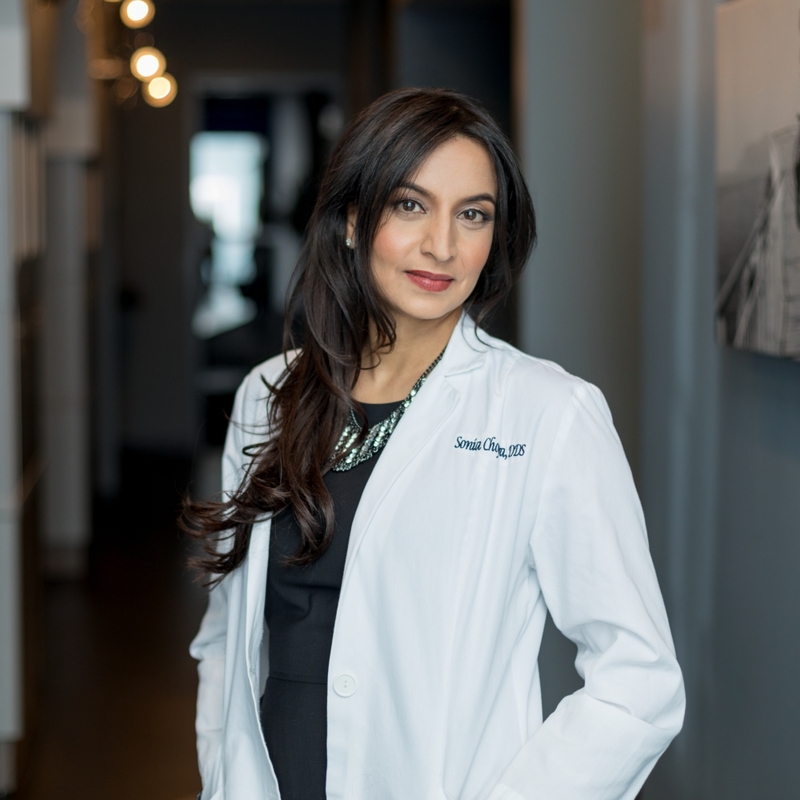 I was first introduced to the CBCT in 2009 at an endodontic CE event, but since I had just opened my practice, I didn’t have the funds to think about purchasing one. This machine is so powerful, but it does have limitations. Even with all its advantages, there is one thing that a cone beam can’t do. It can’t routinely detect a crack. This limitation is one that many general dentists don’t quite understand. 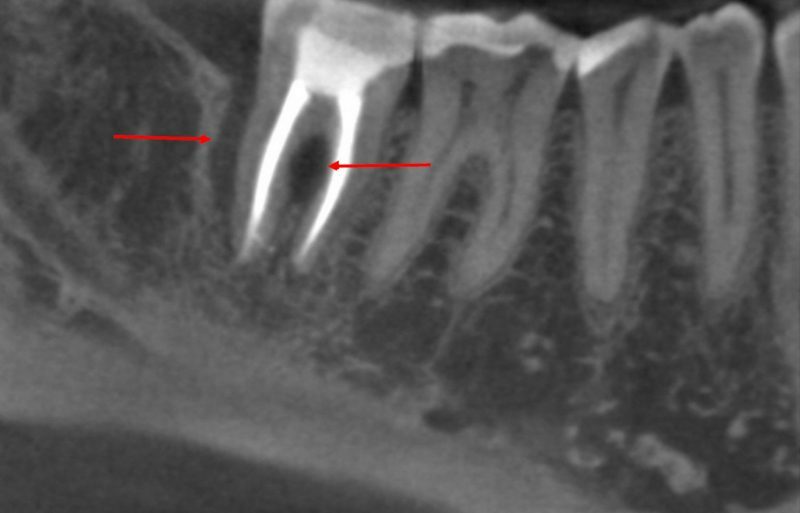 I hear so many referring dentists tell their patients that they need a scan in order to see the crack, which then leads to patient frustration when an endodontist can’t deliver that information. They wonder why their dentist told them that in the first place! Be careful what you say to your patients, because sometimes it can be misleading. I never promise a patient that I am going to see a crack on the cone beam, because this simply isn’t why I order a cone beam. Let me show you an example so you see what I mean. A patient had a previous root canal and a draining buccal sinus tract. The sinus tract was traced to the furcation. Her diagnosis was Previously Treated Tooth and Chronic Apical Abscess. The root canal (done by another professional) looked like it was done really well, but the tooth was never restored with a crown. This image clearly shows the furcal breakdown and the lateral bone breakdown to the distal root. The axial view below is usually the most helpful view when trying to make this evaluation. Let me ask you this: can you visualize the fracture in the image? If so, shout it out right now, and let’s see if you are right! The answer is below. When you are interpreting a CBCT, be careful about false positives that are actually artifact. When a tooth has a radiopaque material in or near it (i.e. gutta percha or an implant), watch out for scatter, beam hardening or reconstruction artifact. If you look at the axial slice again, you will see several black lines that look like cracks, but are actually nothing at all! 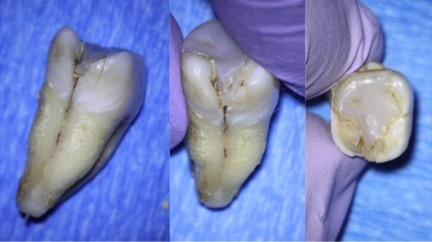 From these images, you can clearly see the crack along the distal root that starts on the distal marginal ridge and goes all the way down to the apex. This crack is huge, and it never showed up on the cone beam! So here is a little trick that may help: instead of looking for an actual fracture line on the cone beam, look for patterns of bone loss instead. 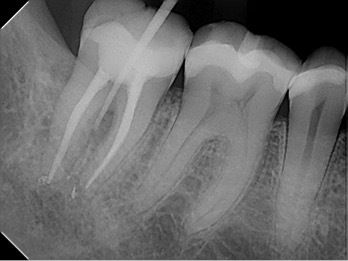 The bone loss adjacent to the distal root is what you SHOULD be looking for, and not the line itself. For more info on how to do this, click here for a must-read article. I have seen some teeth where their fractures can be detected on the CBCT, but they are the exception to the rule. Generally speaking, if you can see the fracture on the cone beam, you can usually see it on the periapical radiograph, too. I wish I could say that the CBCT could detect cracks and fractures in addition to its many other uses. My job would be so much simpler if that was the case! At the end of the day, I’d encourage you to be careful what you say to your patients, and let them know what they can and can’t expect from the cone beam. 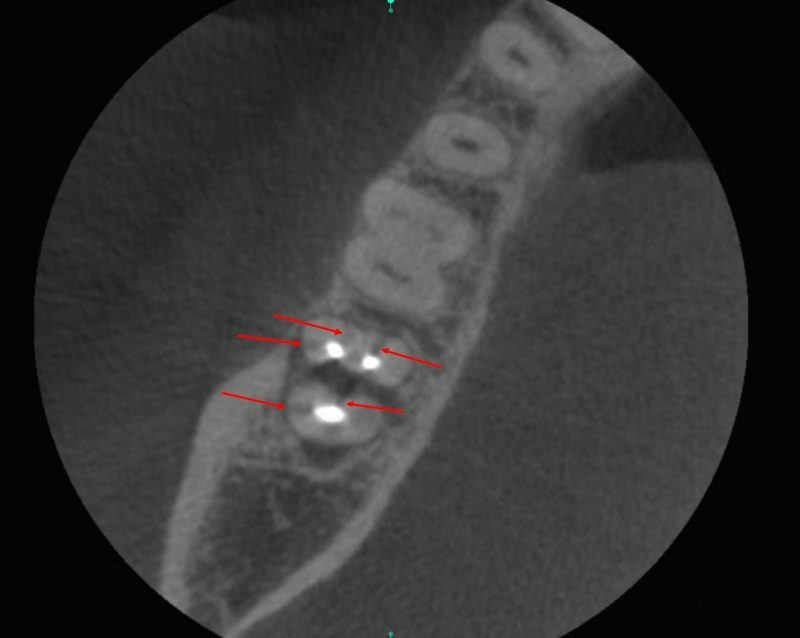 The better your understanding of CBCT, the better you’ll understand the capabilities and limitations of this near-magical machine — and the better care you’ll be able to provide to your patients. Really informative article! Thanks for this explanation. It can truly help my patients have realistic expectations. Thank you Rebekkah – it’s all about the patient! I think many people are misled about this. Thanks for your explanation. Fantastic, very succinct and useful information! Love the work you on it! Thank you Ernest! I appreciate you following along. Stay tuned for more! Great information! Thanks for your images and clear explanations. Thanks for reading – and stay tuned for more! Amazing Dr Sonia. Quite a enough information.